So if you didn't know, today is the 1st of November! It is a big day in Australia. 1. It is the day of the race that stops the nation! The Melbourne Cup! 2. The time of year when all the men seem creepy and weird, and you try to keep your children away from them. At least it is for a good cause! The point of Movember is to grow a moustache to support men's health. Specifically raising money and awareness for depression and prostate cancer. If you are unable to grow a moustache, well then just jump on board and support those who do. Yeah.. I just had to do it! 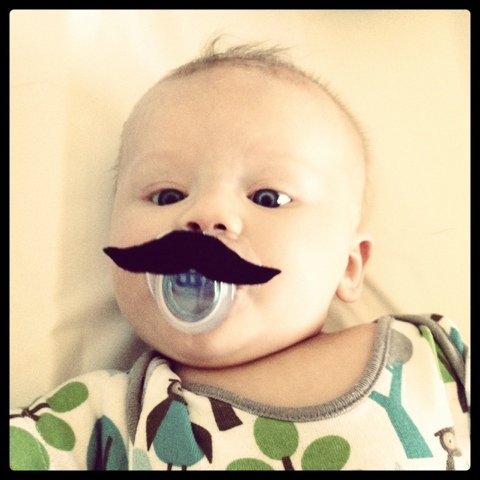 He's too small to grow a moustache.. but he can still join in. Joel is undecided about growing a moustache this year, because it would mean shaving his beard, although he has talked about just doing the fundraising part of it. He does look like a bit of an 80's cop with a moustache. One of my favourite burger joints Grill'd also gives free burgers this month to anyone who has raised over $40... how awesome is that! 1 comment on "It's Moustache Season"